IT IS a losing battle for conventional antibiotic drugs. Many of them can no longer effectively control or kill their target microbes. The threat of antibiotic resistance in pathogenic bacteria has necessitated development of new antimicrobials, called the next-generation antibiotics. Scientists have now found that dermicidin, a compound produced naturally by the body, can act as a potent antimicrobial agent. The human body, particularly the skin and the mouth, is constantly exposed to a variety of bacteria but still maintains a healthy stable state. Skin, the first host tissue to encounter atmospheric bacteria, responds through an elaborate signaling network. It produces antimicrobial peptides (AMPs) and small protein molecules (cytokines) which zrigger immune responses. These naturally occurring classes of antimicrobials have novel mechanisms of action, which ensure that microbes have little chance to develop resistance and are effective against a broad spectrum of bugs, including bacteria, fungi and virus. 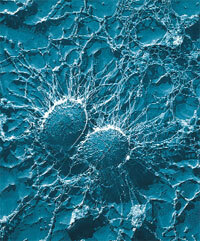 They are, therefore, promising alternatives or augmenters of synthetic antibiotic therapies. Dermcidin, one of the most important AMPs secreted by sweat glands of the skin, is known to be robustly active against a wide range of disease-causing bacteria such as drug-resistant Staphylococcus aureus and Mycobacterium tuberculosis. A research team led by Chen Song, of Computational Biomolecular Dynamics Group at Max Planck Institute for Biophysical Chemistry in Germany, examined the antimicrobial mechanism of dermcidin. The researchers found that it efficiently damages bacterial cell membrane by producing ion channels across the cellular envelop in the presence of zinc ions. Cell membrane integrity is essential for bacterial cell survival and development of antibiotic resistance. Their X-ray, electrophysiology and simulation data suggests that such channels are highly permeable to water and ions and allow their uncontrolled flow across the membrane, eventually killing harmful microbes. The study, published in Proceedings of National Academy of Science on February 20, 2013, also shows that dermcidin can adapt to different types of bacterial membranes. This explains why it is an efficient, broadspectrum antibiotic, which can ward off both bacteria and fungi.